Getting rid of pasture weeds is extremely simple using your electric fence grid and daily pasture rotation. On this page, Part IV of the Pasture Management with Electric Fences article, I will show you how to battle weeds just by manipulating your cattle's grazing behavior out on pasture. I'll explain how to keep your pasture grass competitive to squeeze out weeds from your pasture mix, how to use grazing to damage weeds when they are most vulnerable, how to use cattle to clear thick brush and dense weed patches to make way for new grass growth, and how to eliminate weed reservoirs so they don't contaminate your pastures with their seeds. The first three parts of this article have focused on the grass, soil, and water in your pastures. But no discussion about pasture management would be complete without a discussion about pasture weeds. It's actually remarkable how easy it is to manage weed pressures in your pastures simply by manipulating how your cattle grazing affects your pastures during rotational grazing. It's simply a matter of changing your cattle's behavior using your pasture fences so you can harm weeds while encouraging your grass to out-compete weeds on their turf. Keeping grass competitive to put pasture weeds at a competitive disadvantage. The first step in combating pasture weeds is to create an environment that puts weeds at a competitive disadvantage. Weeds are not plants that evolved in a grazing environment. They are opportunists that only invade areas where the pasture grass has been weakened or put at a competitive disadvantage. Weeds don't tolerate repeated grazing. Their root systems are not as aggressive as the vigorous sod-forming root systems of grass plants. And in the fierce competition for sunlight, weeds cannot out-compete grass and will gradually be starved for light unless your pasture rotation leaves behind weeds that are taller than the grass around it. In the slow moving competition for sunlight among plants, whoever creates the biggest shadow wins. Whoever makes the shade wins, whoever lives in the shade loses. Pasture management designed to reduce pasture weed pressures is all about making sure that your pasture grass never gets caught in the shade of a weed. This means your pasture rotation should never knock grass height down so far that grass growth slows to rebuild root reserves. That means you should always ensure that you leave at least a 6-10 inch grass stubble after grazing so that grass growth can continue at maximum speed immediately after grazing ends so grass can quickly regain a height advantage and shade out weeds. Pasture grass that is clipped too short will be dwarfed and shaded out by unpalatable weeds. Grazing grass too short also means that the grass roots will die back (remember that plant growth above ground always mirrors the root mass supporting the plant below ground). If grass roots die back too far as a result of grazing too short, space will be created for invading weed roots. Maintaining a daily pasture rotation ensures that the grazing impact on your pastures will be more even because of the sense of competition that arises in your cattle herd when they are only given access to a single day's grazing at a time. This ensures that choice grasses are not grazed too short (and end up in the shade) and ensures that pasture weeds and other less desirable grass varieties are grazed indiscriminately during the competitive grazing frenzy that arises in your grazing herd during a daily pasture rotation. When cattle don't have time for selectiveness during grazing they won't leave weeds behind, which prevents the pasture weeds from gaining a height advantage over the surrounding pasture grass. Daily pasture moves are the ideal grazing strategy to keep your grass growing very aggressively, which ensures that the grass will gradually choke out pasture weeds and take over the pasture. A few weeds won't hurt pasture yields and just add to nutritional variety. Daily pasture moves ensure that a few weeds don't turn into a sea of weeds. Daily pasture moves are also critical for grass to regain it's competitive advantage and retake pastures that have been heavily invaded by weeds. If grass is left to go to seed, it will stop growing aggressively to choke out other competing plants, thus opening the door to weeds. Pasture weed management is therefore not only about using daily pasture moves to provide a uniform grazing impact and keep grass from getting cropped too short. 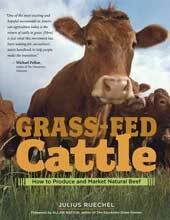 It's also about coming back often enough with your cattle herd to re-graze pastures before they have time to stop growing and go to seed. Your electric fence grid is therefore your primary pasture management tool so you can use your cattle to keep your pasture grasses as competitive as possible to prevent weeds from gaining a competitive edge. Keeping weeds uncompetitive also means getting to know your weeds better. Every plant has stages in it's growth when it is particularly competitive and other stages when it is vulnerable. Even your grass is this way. When grass is short, it grows slowly, is easily shaded out, and cannot access moisture and nutrients lower in the soil horizon. And when grass is left to go to seed, it stops growing and also becomes uncompetitive, making way for other plant species to invade the pastures. Keeping grass competitive is therefore about making sure it is always at least 6 - 10 inches tall and never allowed to go to seed. Weeds are the same, only in their case we want to use grazing to keep them uncompetitive. That means getting to know each problem plant in your pastures so you can time grazing to keep them on the defensive. For example, thistles can be clipped extremely short and will continue to grow aggressively - it even allows them to spread out and take over pasture space. But short thistles will stall in their growth if they are shaded out by surrounding pasture grasses. 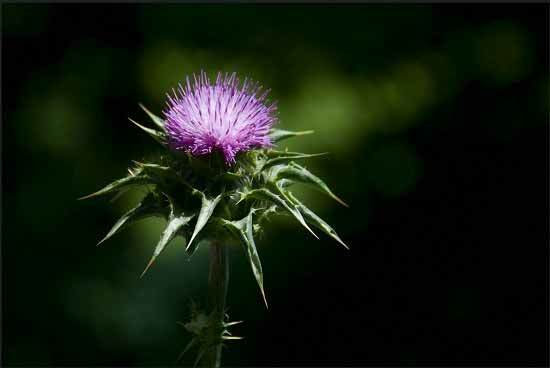 Thistles that become extremely tall will not be harmed if they are clipped, but if the flowering buds are removed without removing the rest of the plant, then there are not enough energy reserves left in the thistle to keep growing and producing new seed heads. 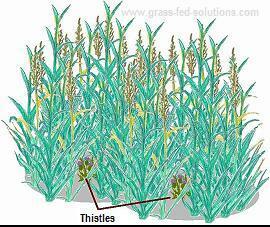 The thistle will simply stall, it's energy reserves wasted on supporting a large plant with no further seed producing abilities. As you eliminate pasture conditions that cater to the competitive advantages of weeds, they will gradually reduce their presence in your pastures. Many weed problems can also be solved through fertilizer amendments that help grass regain the upper hand. Weeds are often vital clues to soil nutrient imbalances in your pastures. Using daily pasture moves is the best way to ensure that manure is spread evenly so grass can reuse the nutrients for growth. Allowing cattle to graze pastures for many days at a time causes fertilizer imbalances in some parts of your pastures as soil nutrients are transported to favourite bedding areas that are reused over and over again. Areas that are nutrient deficient will be much more susceptible to weed invasion. And areas that have heavy concentrations of manure and cattle urine likewise become prime weed targets because of nutrient excesses that upset the delicate soil fertility and undermine the competitive advantages of your pasture grasses. Create a pasture environment where your grass has a competitive advantage and weeds struggle for access to sunlight. In the plant world, getting stuck in the shade means death. While much of pasture management and weed control is about carefully manipulating pasture conditions to the advantage of your pasture grass and undermining the advantages of your pasture weeds, some weed problems are just too severe to justify a gentle pasture management strategy. Some problems need the blunt end of a sledge hammer. Grazing cattle are very easily turned into a blunt instrument of massive pasture devastation. Most of the time your pasture management is all about avoiding trampling the daylights out of a piece of pasture and avoiding grazing the life out of your pasture mix. But sometimes, when there's not much else besides weeds, you want to create a grazing scenario to cause your cattle herd to smash unwanted plants to make way for new plants. It's simply a matter of concentrating their impact on the right areas until every weed has been trampled beyond recognition. If weeds have completely taken over a portion of your pastures and there is no grass left, your electric fence grid allows you to concentrate your cattle in small areas that you want to aggressively hammer down, like thick weed patches that need to be flattened to make way for fresh grass growth, or heavy brush that needs to be cleared to let in the sunlight and make the pasture grass competitive again. To protect your cattle's nutrition and prevent the trampling from causing soil compaction, it's best to shrink the area you want mulched so the cattle can graze (and trample) it all within a single day, and then start on a fresh piece the next day. Once the cattle have smashed down the undesired plants, it's a good time to spread some fresh grass seed over the devastated area (before the cattle are moved away) so the cattle feet can 'stir' the grass seeds into the top soil layer as they mill about. You can also use the placement of your mineral feeder or mobile water trough to concentrate your cattle impact on specific sections of pasture during the daily pasture rotation in order to target trampling and manure over an undesirable weed patch or unproductive section of pasture. Electric fences allow you to change how your cattle impact the pastures so they can alternately act as a grass trimmer, mower, bulldozer, or mulching device, depending on what's required to knock back pasture weeds and help your pasture grasses regain their competitive edge. The temporary nature of your electric fence subdivisions means that you don't need to create permanent pasture exclusion zones along creeks or other sensitive areas that inevitably turn into week reservoirs, which continually contaminate surrounding pastures with their seeds. A temporary electric fence allows you to graze very close to watersheds or other sensitive areas - but just for a few hours so there is no risk of manure concentration contaminating water sources. Furthermore, you can put the pasture fence subdivision in a different location during each pass of your pasture rotation so you can strike the delicate balance between protection and overgrazing - thus keeping grass competitive and growing aggressively in these exclusion zones while keeping up pressure on pasture weeds that tend to take over these areas when they are not periodically grazed. Pasture fence lines are notorious weed repositories because they create inaccessible areas that cattle can't reach to graze. This allows pasture weeds to take over the fence lines and continually shed seeds that contaminate adjacent pasture areas. But using an electric fence grid again has multiple advantages in this arena. The single wires used on all interior electric fences easily allow your cattle to graze underneath the wires without getting zapped. It's quite normal to see the pasture grass grazed at least another foot past the electric fence (on single wire electric fences with the wire hung between 32 and 36 inches from the ground). This eliminates the weed build-up around all interior fences. Furthermore, portable fence subdivisions never need to be put up in the same place twice. Even if they are used to protect areas that don't get grazed often, or at all, you can periodically shift the location of your portable fence lines to nip into areas that are showing increased weed pressure to give the pasture grass a chance to regain a competitive advantage. This is often of particular concern when managing the edges of riparian areas, such as ditches, creek banks, pond edges, and lake-shores, which actually suffer as much as they benefit when they are permanently locked away behind an immovable permanent pasture fence to eliminate all cattle access to these weed-prone areas.. This concludes the four-part Pasture Management With Electric Fences article. As you can see from this article, simply by adopting a daily pasture rotation controlled by your electric fence grid (using permanent electric fence corridors that are subdivided by temporary portable electric fences), you have a tremendously powerful tool at your disposal to improve pasture quality and grass yields, improve soil fertility, create a flexible pasture management strategy to manage riparian areas and areas with fragile soils, improve soil moisture and reduce drought vulnerability, and give your pasture grass a competitive advantage over pasture weeds. This makes your electric fence grid your most powerful, most important, and by far the cheapest tool in your pasture management toolbox. Not bad for a few simple wires. Now that you understand how to harness the power of your electric fence grid as your primary pasture management tool, I'd like to show you how your electric fences are equally powerful as your most important beef cattle management tool. The 3-dimensional farm plan - how to use your pasture fence layout to create your grass-fed production plan.